What is a Hip Labral Tear? A hip labral tear is an injury to the labrum, the cartilage that surrounds the outside rim of your hip joint socket. The hip joint is a ball and socket joint in which the head of the femur is the ball and the pelvic acetabulum forms the socket. The labrum helps to deepen the socket and provide stability to the joint. 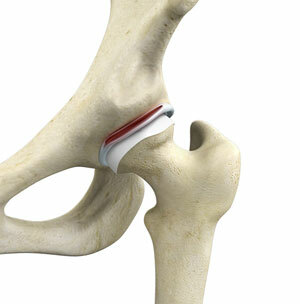 It also acts as a cushion and enables smooth movements of the joint. Your doctor will order certain tests to determine the cause of your hip pain. X-rays of the hip allow your physician to rule out other possible conditions such as fractures or structural abnormalities. Magnetic resonance imaging (MRI) may also be used to evaluate the labrum. An injection of contrast material into the hip joint space at the time of the MRI can help show the labral tears much clearer. Injection of local anesthetic into the joint space is sometimes performed to confirm the location of the pain. If the injection completely relieves your pain, it is likely that the cause of the problem is located inside the hip joint. Treatment for a hip labral tear will vary depending on the severity of the condition. People with a minor labral tear recover within a few weeks with the help of non-surgical treatments. Medications: Anti-inflammatory medications can be helpful in relieving pain and reducing inflammation associated with labral tears. Your doctor may also recommend cortisone injections to alleviate the pain associated with a hip labral tear. Physical therapy : Physical therapy that helps to improve hip range of motion, strength, and stability are also recommended. However, severe cases may require arthroscopic surgery to remove or repair the torn portion of the labrum. Hip arthroscopy, also referred to as keyhole surgery or minimally invasive surgery, is a surgical procedure in which an arthroscope, a narrow tube with a tiny camera on the end, is used to assess and repair damage to the hip. The surgery is performed with the patient under general, spinal or local anesthesia. Your surgeon will make 2 or3 small incisions around the hip joint area. The arthroscope is inserted into the hip joint through one of the incisions to view the labral tear. The camera attached to the arthroscope displays the image of the joint on the monitor. A sterile solution will be pumped into the joint to have a clear view and room to work. Through the other incisions specially designed instruments are inserted. Your surgeon repairs the torn tissue by sewing it back together or removes the torn piece all together, depending upon the cause and extent of the tear. After the completion of the procedure, the arthroscope and instruments are removed and the incisions are closed. Following the surgery, you will be given instructions on caring for your incisions, activities to avoid and exercises to perform for a fast recovery and a successful outcome. Physical therapy will be recommended by your doctor to restore your strength and mobility. Your doctor will also prescribe pain medications to keep you comfortable.